While plastic cutlery and paper napkins aren't exactly the epitome of elegance, folding the napkins around the cutlery dresses up the presentation a bit while ensuring all your guests have the tools they'll need to enjoy their food. Keeping the napkins and cutlery together also secures the napkins so they won't blow away during an outdoor gathering. 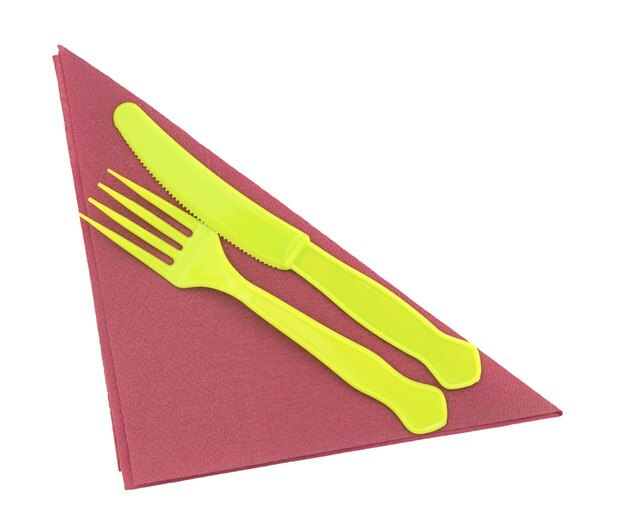 Use colorful napkins and cutlery for a themed event. Classic square paper napkins -- the type already folded into a square -- give you a simple yet attractive way to display that plastic cutlery, once the napkin is folded to create a diagonal pouch. Line the napkin up so the open sides are to the left and on top. Fold the top left point of the napkin down diagonally to meet the bottom right point, creasing the napkin. Flip the napkin over from left to right, and then fold the right side in a third of the way, creasing it. Fold the left side in one-third of the way as well. Flip the napkin over from left to right and insert the cutlery into the diagonal pocket created by the folds. A rolled napkin-and-cutlery set makes cutlery handling a speedy process, allowing guests to pick up the rolled bundles from a basket at a picnic or serve-yourself meal. Fold a large square paper napkin in half so it forms a triangle with the point on the top, fold on the bottom. Set the cutlery in a grouping along the bottom folded edge with the top of each cutlery piece facing to the right. Fold the left and right corners of the napkin triangle inward over the top and bottom of the cutlery group, and then roll the package upward toward the point. Use a napkin band, or ribbons to look extra festive, to keep the bundle closed. A decorative paper napkin perks up that plastic cutlery for a themed event such as an outdoor graduation party or birthday. Set a napkin on the table with the printed or "top" side facing down, if the napkin has one side that's designed to show. Rotate the napkin so it resembles a diamond, and fold the bottom point up toward the top three-quarters of the way. Crease the napkin, and then center the cutlery group, facing upward, in the middle of the napkin. Fold the left corner over the cutlery, and roll the napkin from the left toward the right, creating a "bouquet" of cutlery. Secure the napkin with a napkin band, a colorful twist tie or a piece of ribbon. Jazz up your presentation of paper and plastic by coordinating or theming the items to the event at hand. Pair wine-colored napkins with gold cutlery, for instance, to celebrate a graduation or acceptance to a school with these colors. Mix pastel napkin shades and assorted pastel-hued cutlery for a springtime or Easter celebration, mixing and matching the items, much like an arrangement of flowers or a basket of colored eggs. Stamp napkin bands with a message such as Happy Birthday or Congratulations using rubber stamps and ink to customize them for a special celebration.